Memsource Cloud 4.5 is scheduled for release on Sunday, 17 August 2014 at 9:00 AM GMT. Memsource Cloud 4.5 includes over 100 improvements and bug fixes. Pre-translation from translation memory and machine translation has been available right from the start in Memsource Cloud. 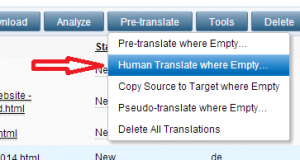 Now we have added human pre-translation powered by Gengo. Gengo is the world’s leading crowdsourced human translation provider that supports dozens of language pairs (primarily with English as either the source language or target language). Memsource is able to offer Gengo translation at the Gengo API rate of $0.05 per word for any language pairs until the end of 2014 (the non-API rate is $0.06). Gengo charges no minimum fee, so even a single word can be translated at this rate from within Memsource Cloud. When they run short of their own translators. For small translation jobs that would be inefficient if translated by the agency’s standard translation process. Billing for Gengo services is extremely simple and works in the same way as for machine translation providers in Memsource. Simply sign up with Gengo, top up your credit and enter your API token in Memsource Cloud under Setup - Human Translation Engines. Refer to our Gengo setup guide for detailed instructions and screenshots. Linguists can now be notified of a new job already during new job creation. 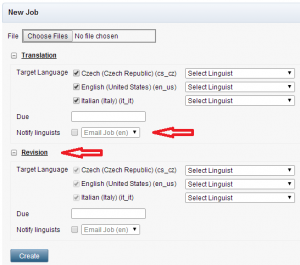 Linguists can be entered for all workflow steps already during new job creation (relevant for projects with workflow). This new option makes it possible to generate separate analyses for all linguists with a single click. 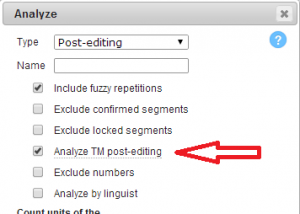 A new option has been introduced to the post-editing analysis. With this option selected, the post-editing analysis will include not just machine translation edits but also translation memory edits. 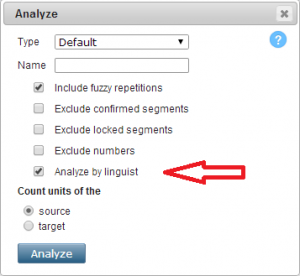 Example: If a linguist modifies a 100% TM match by 10%, the analysis will return 90% with this option selected. The analysis will return 100% if the option is not selected. It is now possible to set a default project owner in a project template. This can be useful when projects are created in an automated way, for instance via an instant quote widget, and the projects should be assigned to different project owners based on specific source/target languages. Previously, Memsource was very strict and made it impossible to change the source language or remove target languages from an existing project. It is now possible to change the source language and remove target languages if it causes no harm (e.g. if no jobs, translation memories or term bases have been added to the project). Previously, shared projects were not supported in trial accounts. This has changed now. The context note for XML is not a new feature. However, previously it was not configurable. Now it is possible to define what should be extracted as a context note. The context note and other context information can be easily displayed for each segment in both Memsource Editor and Memsource Web Editor (Tools - Toggle Context). 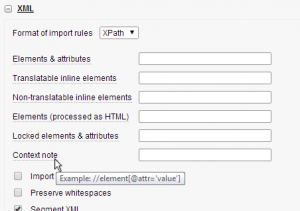 Please note that the context note for XML is only supported in the XPath file import settings. “Convert to Memsource tags (use regexp)” is a new option in the HTML file import settings. A MS Word file includes embedded MS Excel sheets. Hidden cells are merged with visible cells in MS Excel. Incorrect encoding for some localization file types. Importing an SDLXLIFF with locked x tags. The option “Activate/deactivate linguists automatically” under Setup - Access and Security is now also available in the Team edition. With this option on, linguist users are made inactive automatically once they set a job to completed if they have no other jobs open. Safaba MT engine is now available in Memsource Cloud. PROMT MT engine is now available in Memsource Cloud. We have introduced a new call that will return the number of remaining unused user licenses. A new API call has been introduced, related to shared projects that makes it possible to assign vendors. It is now possible to create a project based on a project template via API. It is now possible to create and list project templates via API.